The weather here in Vancouver was just perfect recently, not too cold and lots of sunshine. So, I jumped on the opportunity to fire-up the outdoor grill that’s been sitting idle and cooked up a flavorful Vietnamese inspired grilled chicken. Grilled chicken is fantastic on it’s own or as topping for salad, pizza, etc. Today, I'm using it for a Grilled Spicy Chicken Sandwich recipe. 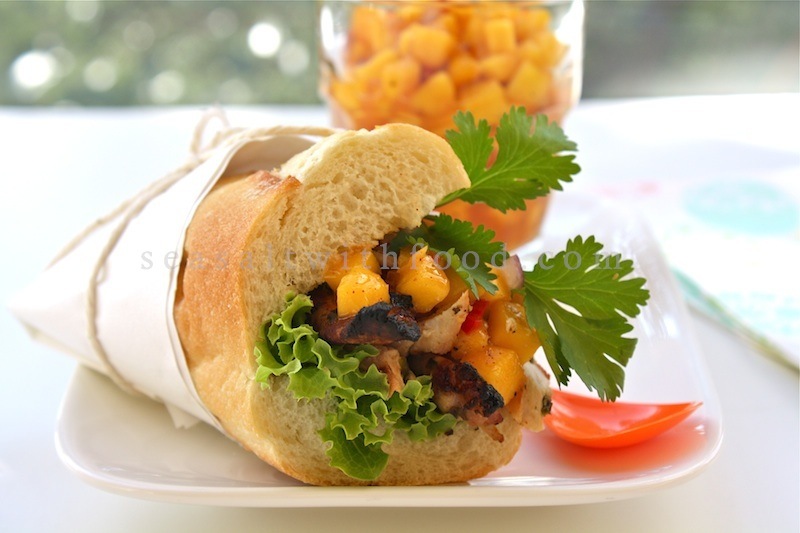 The “spicy” here comes from the mango salsa and not the chicken meat. So, just reduce the amount of chilies in the salsa recipe to suit your taste bud. FYI, I will be posting another recipe idea using grilled chicken tomorrow, check it out! In a medium bowl whisk all the marinade ingredients. Place the chicken pieces in a large resalable bag and pour in the marinade. Turn the bag to distribute the marinade and refrigerated for about 4 to 5 hours. 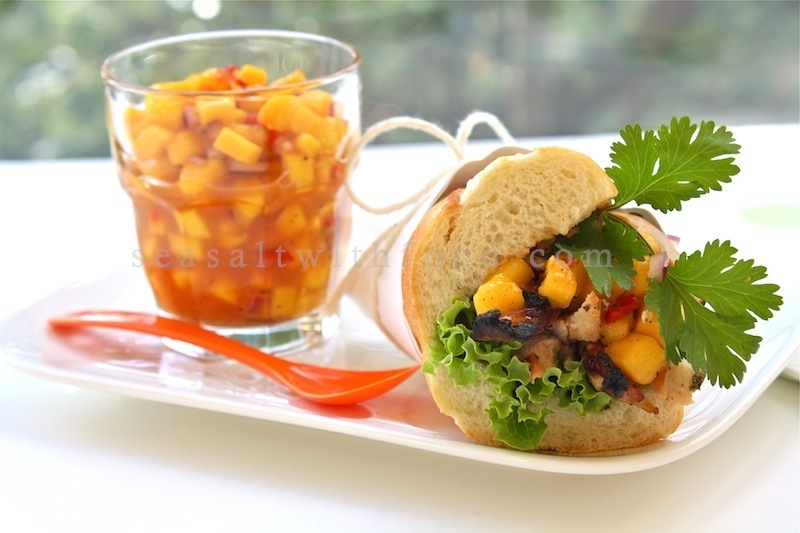 Make the mango salsa: Combine all the ingredients and season with salt and pepper. Cover and refrigerate until serving. Preheat the grill for direct cooking over medium heat. Grill the chicken with the lid closed for about 5 to 6 minutes each side. Remove from the grill and allow to cool slightly before slicing. Make the sandwich: Lightly grill the rolls, cut side down over a direct medium heat for about 40 seconds. 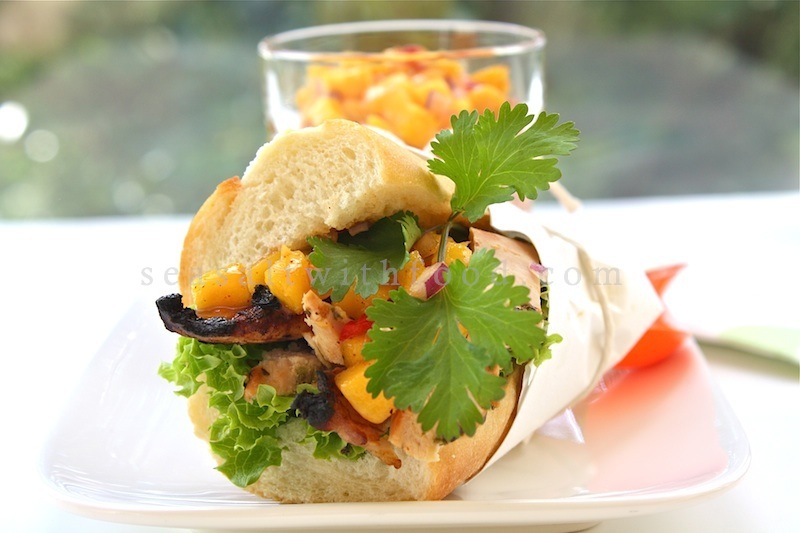 Place one or two pieces of lettuce leaves on the bottom of each roll, chicken and top with some spicy mango salsa and cilantro. Serve immediately with extra salsa on the side. This sandwich look so tasty!! Spicy food for me anytime! Nice! That sandwich looks so good! I really like that mango salsa in it.